For the avid golfer, and even the intrepid beginner, Ocean Isle Beach rentals sit within eight delightful miles of twenty golf courses. And if that's not enough to keep you swinging away, you're within forty-five minutes at the most for over one hundred golf courses! Although you can drive to an endless variety of green links in further flung towns, what could be easier than enjoying some four and five-star rated courses just within minutes of your front door. There are a number of excellent courses, both in Ocean Isle Beach and in Sunset Beach which is within five to eight miles of your vacation rental. According to Golf Link, a popular golf directory site, there are 28 golf courses within 10 miles of Ocean Isle Beach, many have earned 4 and 5 star ratings. Oyster Bay Golf Links is within six miles and has earned a five-star rating. An eighteen hole course, these links were designed by Dan Maples and the reviews were all outstanding. 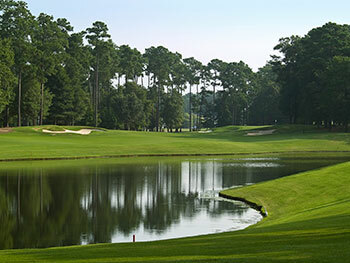 Also close to home is the four-star rated Tiger's Eye course right in Ocean Isle Beach. A very popular eighteen hole course, this facility was designed by Tim Cate and opened in 2000. It won two awards in 2006, both from Golf Digest magazine. And if playing eighteen holes of golf doesn't leave you enough time for lazing in the sun or perhaps searching for that perfect sea shell, Thistle Golf Club's three nine hole courses will exactly fit into your busy, or leisurely, schedule. With three separate nine hole courses, all rated from four to five stars, this course is about five miles from Ocean Isle Beach. Other close golf courses, some award winning, include Lion's Paw, Brierwood, The Pearl, Panther's Run, Sea Trail and Sandpiper Bay. Just a few miles further you'll find Brunswick Plantation and Carolina Shores. So load up your clubs, pack your golf shoes and don't forget the sunscreen because an Ocean Isle beach rental will get you up and out and on the green before you can say "Fore!"